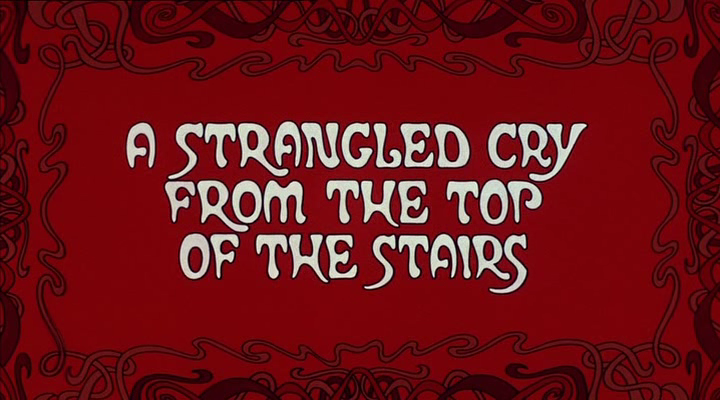 Really gorgeous art-nouveau intertitle from THE WRONG BOX, directed by Bryan Forbes. Fiona always says, when BF’s name comes up, that when he dies the British will suddenly appreciate that a major film talent had been in their midst. Perhaps the problem has been that Forbes, a spiky personality with a strong sense of his own worth, has appreciated himself too much and not left room for anyone else. He was the only filmmaker polled by Sight & Sound magazine who chose one of his own works for his personal Top Ten Movies of All Time. Forbes selected WHISTLE DOWN THE WIND, which at least shows he has good taste. 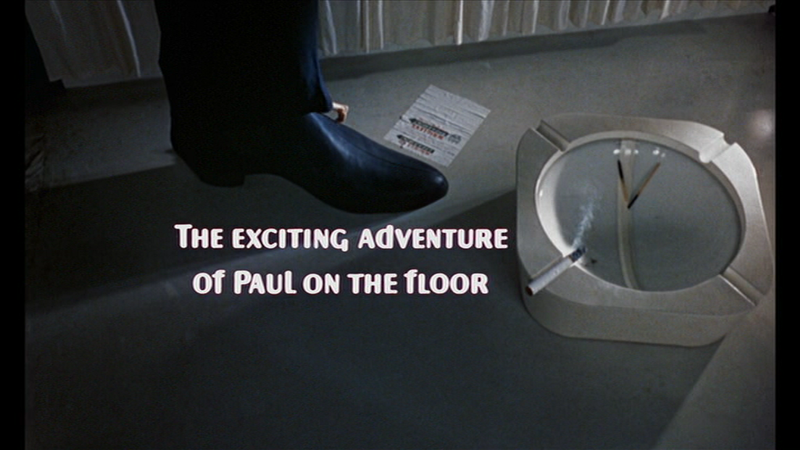 Anyhow, the above intertitle always cracks me up. Clearly influence by HELP!, made the previous year, although the influence really goes back to the cinematic playfulness of the nouvelle vague, it’s especially amusing by way of its utter redundancy: like the comic book sound effect captions in SCOTT PILGRIM, the intertitle describes something we can perfectly well hear for ourselves. THE WRONG BOX is adapted so loosely from Robert Louis Stevenson and Lloyd Osborne’s novel that another version seems like a perfectly good idea — the book has some very funny bits of its own, with only the idea of a corpse in a trunk in common with Burt Shevelove and Larry Gelbart’s busy script. Osborne’s influence on Stevenson seems to be to rid him of his moralistic side, and the short novel is an exercise in infernal bad taste. I enjoyed it considerably. Absolutely no silent movies watched this week, so here is my favourite quasi-intertitle from a talking picture, HELP! 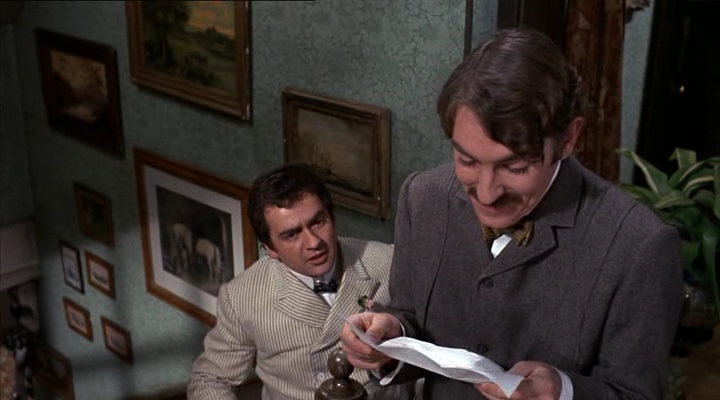 I like this one even better than the splendidly redundant “A strangled cry from the top of the stairs” in Bryan Forbes’ THE WRONG BOX, which is followed by the sound of a strangled cry from the top of the stairs, emitted by Peter Cook. In the scene illustrated above, Sir Paul McCartney, injected with a shrink serum, is diminished to Grant Williams-like proportions, emerging naked from his own trouser leg, long before it was fashionable to do so. I suggest that any directorial career which could encompass a scene such as the one above as well as one where Sean Connery and Robert Shaw batter each other with maces, is a rich and fascinating one. Actor Steven McNicoll, in addition to his invaluable services to the nation as actor and funnyman, has a stockpile of thespian anecdotes second to none. Here’s one you might enjoy. Wilfred Lawson, left, in THE WRONG BOX, suffering from the advanced stages of Wilfred Lawson Syndrome. I’ve written before of Wilfred Lawson, character actor and celebrated inebriate. One of the few actors who could function quite well with a skinful, and who always seems quite drunk anyway when you see him in films. But there are limits, and you had to get him onstage or in front of the cameras before complete paralysis set in. It seems he was to do a live radio show. A minder was given the task of keeping him from the demon drink. The minder escorted Lawson to a dressing room and locked him in. The room had been thoroughly searched, and did not contain a trace of liquor. Lawson was sober when he went in, and had no booze on his person. There were no windows, and the only door was securely locked from the outside. The minder had the only key. Returning after an hour to collect Lawson for the broadcast, the minder finds him utterly rat-arsed, pissed beyond language. How was this possible? Readers of John Dickson Carr might have the advantage in guessing this one, since Carr performed so many variants on the classic Locked Room Mystery during his long career (yet there are only a few movie adaptations, THE MAN WITH THE CLOAK being perhaps the best). In The Hollow Man, Carr’s obese detective, Dr. Gideon Fell, actually lists all the different solutions possible to an L.R.M. And it STILL doesn’t help the reader reach an answer to the problem at hand. 1) The crime was committed BEFORE the room was hermetically sealed, despite appearances (see The Mystery of the Yellow Room). 2) The crime was committed AFTER the room was unsealed, despite appearances (the husband rushes in and quietly throttles his fainted wife while his friends are going for the doctor). 3) The room is not 100% sealed — there exists some kind of ingenious secret access (see The Murders in the Rue Morgue, where an inaccessible window turns out to be perfectly accessible — if you happen to be an orang-utan). 4) The crime was self-inflicted, with a cunning mechanism designed to disguise the fact (such as an elastic band that yanks the fatal pistol up the chimney when it is released from the victim’s hand, thus concealing the ugly truth of suicide). I suppose I ought to tell you the answer to this one, but I’m quite curious to hear your suggestions first.